September 2009 - Pebbles, Inc.
Hi All! It is about an inspiration on Wednesday. When I live, I have got many inspirations. It is a family, a friend, television, and a magazine… and more! When I make a work, the photograph which will be used first is faced. 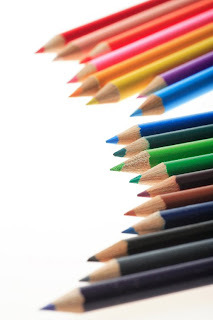 Color is very important for some main colors. I choose out of the color in the photograph, or the situation at that time. I may get the hint of a design from a paper etc. Probably, it will be very important. I may get the hint of a design from a paper etc. Probably, it will be very important. Relaxing is also important in order to obtain an inspiration. 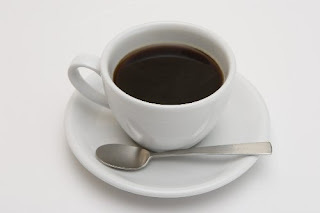 I love coffee very much. It is required for my relaxed time. A thing important as well as coffee is music. I listen to music, it relaxes and a title may appear from a music name. Thank you, check back Friday!! Pebbles Inc. Handmade Flower Challenge! Hello, everyone! 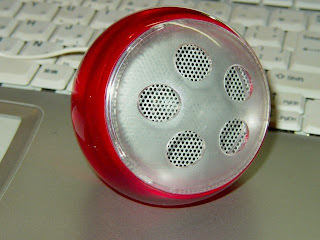 My name is Akiko Kuroki and an on-line name is akilia. I work the host of the Pebbels Inc. blog of this week. My challenges are handmade flowers. Flowers are the important decoration which gives brightness to a layout, a card, etc. I propose carrying out handmade here. Check the wonderful work which Pebbles DT created. It all deserves admiration! Here is my layout.I made the flower using the scallop border. You are troubled by how to use the chip of a paper, and propose the method of cod roe. If the scallop border is bent so that a circle may be made, an original flower will complete it. I expect that you make a work using an original flower. Let’s make a great work using Pebbles Inc.collection! 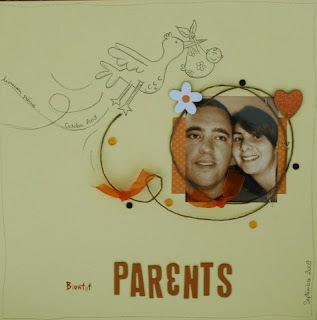 When it comes to scrapbooking, doodling seems to be a technique that some people do well at, or some people run away from it. Doodling is a great way to express yourself artistically and when added to a layout, it can be like adding your own signature, like an artist would do to to their own masterpieces. Normally when people think of doodling they think it’s just a drawing, but that drawing can add so much to a layout and even make an excellent accent to a page just like this one from DT member Maureen: Doodling on a layout can even be something as simple as outlining a little border around paper and accents. (Here’s a tip: when doodling, just go with the flow and faster, when you think about it too hard and go slowly, it can have disappointing results. I have found when I just “go with it” it seems to give me the more whimsical look I am desiring.) For my layout I doodled some border lines with a black and white pen, but I also “doodled” my pink accent flower on the bottom corner. Using one of the Pebbles Inc templates, I created my own little whimsical accent to match my layout. To do this all I did was use a template, and trace the shape of one of the flowers. Then I removed the stencil, then traced losely over the flower shape a few times (no need to go perfectly over the same lines) then I added some dots, colored in with some Pebbles Inc chalks and added a Pebbles Inc Chips chipboard circle and the flower center. Then I cut around it and used pop dots to adhere, and there you go! 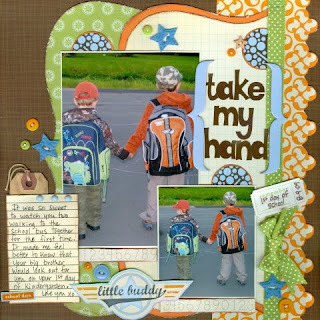 For my layout, I used the Skipping Along line by Pebbles Inc., as well as Chips, Dots, and Chalks! 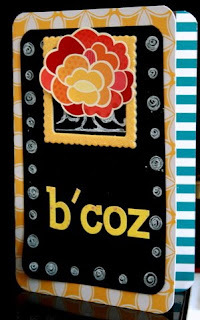 DT Member Lynn made this super cute card using the stencils as a template to make her own “die cuts” and then doodled some dots and dashed to complete her card! 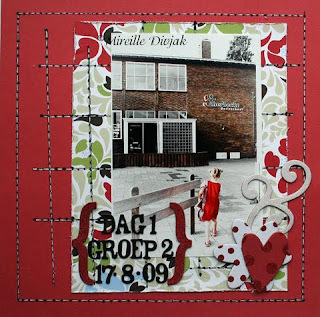 DT member Gaelle created this beautiful layout using the stencils to accent her background. 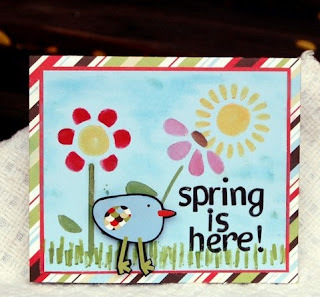 DT member is Emeline made this card and used stencils and a white pen to make these great accent circles. DT member Debbie created this scenery using the stencils to doodle and chalk for a cloud background. 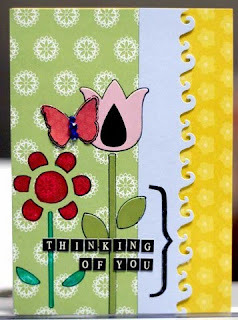 DT member Deanna made this card by doodling the red flower with a stencil and the bracket, which added to the matching stckers and paper. 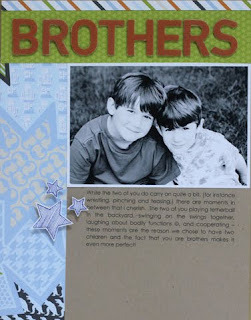 Dt member Celeste used a stencil to make stars to match her “Brothers” layout. Sometimes when you can’t find the perfect accent, you can easily make your own! Well, thanks for joining me on the Pebbles Inc. blog this week. I hope I have inspired you to get those back to school layouts done, helped you find the perfect words for journaling and helped you learn about one of my favorite techniques, Doodling! Finding the right words for journaling, or the right title for my layouts has always been my number 1 problem when it comes to scrapbooking. I often turn to quotes and lyrics to help me find those words of inspiration and today I thought I’d share some finds with you. I love a good quote…who doesn’t right? I have 2 sites that I frequent when I’m looking for the right words to express on a layout or project. 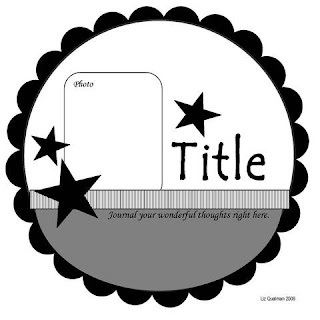 www.writtendecor.com is actually a vinyl lettering site for home decor, however, they have a lot of quotes organized on there and they are perfect for scrapbooking as well. The other site I frequent is www.quotegarden.com this site has a quote on everything…I mean EVERYTHING. Take a look to see what I mean! There are plenty of quotes and sayings there to help jump start your journaling or put that perfect touch onto your project. Another thing that I love to use for my journaling and titles are lyrics. I am a big music lover and some music just has the best messages within the lyrics or maybe while you’re listening to a ballad you may find that they are describing exactly how you feel about a love one. I like to go to www.lyrics.com and www.azlyrics.com to look up the lyrics to make sure I’m copying them right, some of my favorite layouts are ones I’ve used lyrics for the journaling and if you haven’t tried it, next time you’re in a journaling slump try it out! Finding the right words can sometimes be difficult, but thanks to the internet, books, magazines, etc. we can find someone else’s words that will fit just perfectly! I hope I have given you some resources to help in your journaling and if you have any tips or sites you’d like to share when it comes to journaling, please leave a comment! We’d love to hear them! Hello Everyone! My name is Ginnifer and I will be your DT host here for this week. School has been back in for a month now for us here in Southern Utah, but different parts of the state, country and even world started at different times and school is back in session everywhere! This challenge is a simple one, but if you’re like me, sometimes events don’t get scrapbooked right after they happen. But, not this time! For this weeks challenge lets get those back to school layouts scrapped! Any of the Pebbles Inc lines work perfectly to highlight your little one’s back to school days. 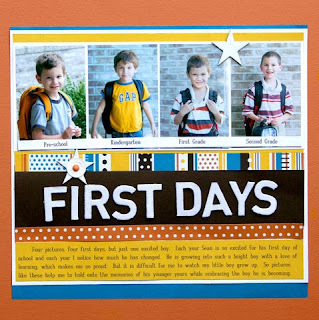 In my example I used the Lil’ Buddy line to document my son’s first day of 5th grade.I love how this line works for baby boys all the way up to the big boys! Design Team member Liz participated in this challenge, and has provided this great circle sketch to go along with her layout! Who doesn’t love a great sketch and this one is circle! I’m definately saving this one for future use. Thanks Liz! 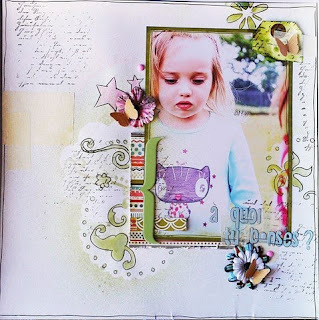 In her layout she used the Lil’ Miss collection for use with a school portrait, how cute is that? Pam used the Downtown line in this great progression layout. This is a great way to show how your child has grown every year. Great idea Pam! DT member Mireille used the So Tweet and some stitching to create this layout of her little ones first day of kindergarten. Kim cut around some of the pattern for an accent strip in this layout with her middle schooler’s first day and I love how she added the stems to the Pebbles Chips’ flowers! Our last layout for inspiration comes from Susan. 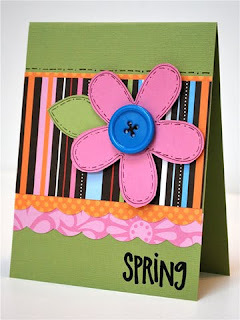 This is an excellent example of a white space layout and a good way to make your scrappy supplies stretch. I love the different strips from different lines make up a perfect accent to her page! Well, that is all for today. Thank you for stopping by and I’ll be back Wednesday to share some bits of inspiration, so see you then!